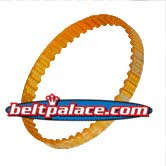 Bando 170XL050U Premium POLYURETHANE Timing Belt. 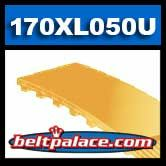 170XL050U (UG) Polyurethane/fiberglass Belt. PREMIUM BANDO USA TIMING BELT. 17” Length OC (432mm). 85 teeth. 1/2" (.5 inch) wide. 1/5” (.200”) Tooth Pitch. Replacement “XL” Timing Belt. Premium replacement belt for power tools/equipment such as belt sanders, coil winding machines, water pumps, benchtop lathes, and robotic equipment. Pegasus Water Pump Motor Belt 166-01-170, 1/2" Wide, 85 teeth, Polyurethane/fiberglass Cord. Standard duty Richeng 170XL050 belt. Gates, Browning, Goodyear, Dayco, Bestorq - 170XL050 black rubber belts. Jet/Acra Lathe Model NR BV-920 Drive Belt (orange polyurethane). 170XL050 Belt. PREMIUM BANDO USA TIMING BELT. 6” Length OC (432mm). 85 Teeth. 1/2" wide. Replacement 170-XL-050 Timing Belt.